As we finish up our month focusing on Spring Cleaning, we are going to take another look in our souls, clearing out the cobwebs, and checking our motivation. So, here we go! There are things that none of us want to do. But we have to. There are things that we are asked to do and don't want to. But we have to. There has been a huge movement towards the lifestyle of "being your own boss." I love small businesses. I love to support small businesses. They are the symbol of freedom and chasing down dreams. But the reality is, whether you work for yourself or for someone else, there will be things you have to do even if you don't want to do them. It may be at the request of a client, a co-worker, a family member, your boss, a neighbor... plenty of people make requests of you, be it your time or otherwise. I can say there have been times when I have been asked to do something and just want to roll my eyes and respond with a firm "no." But I don't. I may mentally respond in that way, but in reality I give a "sure, no problem," kind of response. We will all be asked to do things we don't want to do. We will all be asked to do things we don't think are necessary or important. But as I am learning, we must do them anyways. Not begrudgingly, but joyfully. Why? Because we're not doing it for them. With those two scriptures in mind, work ethic and work attitude is revolutionized. All of those ridiculous tasks are no longer so ridiculous. That annoyance that creeps in when asked to do something outside of your job description is silenced. Why? Because we aren't working for our boss or even our clients, we are working for our Lord. I have been mediating on these verses. Anytime I get frustrated I remind myself, "I am doing it for Jesus.... I am doing it for Jesus." I challenge you to do the same. It may not change anything at work, but it will change you. It transforms your heart and revolutionizes the way you work. It isn't about working anymore, it is only about serving. Serving God. People can have their opinions. They may think we don't do enough, or we do too much, but their opinions aren't supreme. It's God's opinion that should be the motivation behind everything we do. And it is important to remember that God sees it all. He sees what we do, but He also see how we do it. We can get hung up on doing things for people who deserve it. They may not deserve it, but Jesus does. 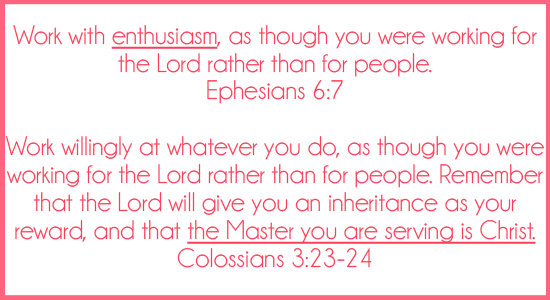 When we are doing it for Jesus we will never feel as if we are working in vain. You know, we can't get caught up on what other people are doing or how they are doing them. You don't have to answer for their action and attitudes. You have to answer for your own. Don't get discouraged by all you have done that seems to have gone unnoticed. While they may not have acquired the recognition you would like, just wait. God sees. He knows the sacrifices you have made. And He cares. He cares about the hard work. He cares about what you have accomplished. He cares. People may not care, but it needs to be enough that God does. And when He is who you are doing it for, that's all that will matter. Keep doing what you're are doing, knowing you are doing it for Jesus. This will keep your motivation set on pleasing God and not man, and your heart clean before God. Totally needed to read this as I am getting ready to head back to work after a long, lovely vacation. Great (hard) reminder.